It was difficult to watch Life Raft without being reminded of how a photograph of the body of a young boy washed up on a Turkish beach had just significantly shifted the conversation about how the world responds to the Syrian refugee crisis. 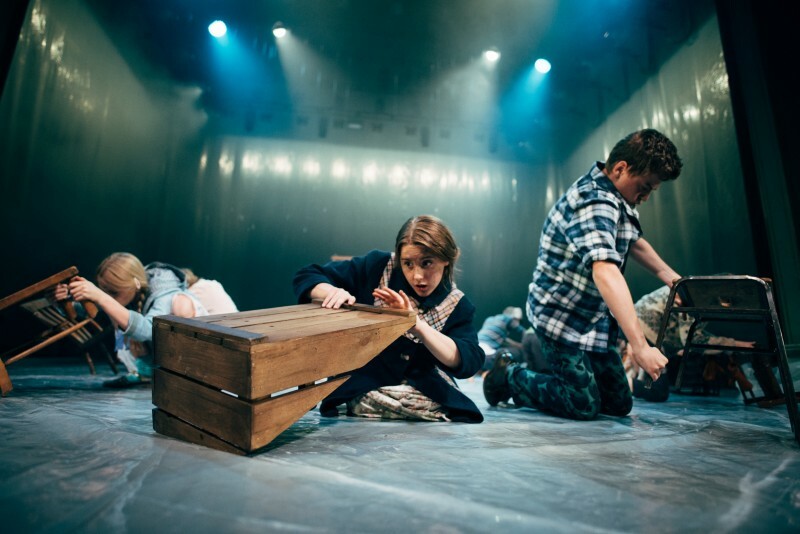 In Bristol Old Vic’s powerfully resonant production, thirteen children are stranded aboard a lifeboat with tragic consequences, and while the circumstances might be very different, the challenge both scenarios present to how we understand our humanity is not dissimilar. Based on Georg Kaiser’s 1945 play, The Raft of the Medusa, Fin Kennedy’s adaptation updates the context to a non-specific but recognisably modern-day world, where there has been war for as long as the children can remember. With no idea where they are, limited rations, and little prospect of rescue, they have to work out how to survive. A mute stowaway, named Foxy by the children on account of his red hair, takes their number up to thirteen and becomes the scapegoat during much of what follows. Kennedy’s agile and sensitive writing brilliantly captures the moment-to-moment urgency of the dilemmas the children face and their varying responses. There are times when it’s very difficult to watch, not least because – as the protagonists are children – an adult audience feels necessarily implicated in the course the action takes. While the production is very much an ensemble piece, it’s the story of thirteen year old Ann (Amy Kemp) that we follow most closely. One of the oldest, and self-appointed second in command, it’s in her that the conflicts between instincts, ideals, and intellect are most effectively dramatized, and it’s the image of her grief and agony at the end, as she’s unable to bear living with what she didn’t stop happening, which stays with us. Max Johns has created a beautifully desolate seascape, with an expanse of clear plastic sheeting that extends up the back wall of the theatre, shimmering and murky under Tim Streader’s atmospheric lighting design. The lifeboat itself is a precarious structure, represented by partially submerged chairs and crates, which are nimbly rearranged throughout. Director Melly Still has elicited some phenomenal performances from the young people – assured, nuanced and brave – and it seems important to note that while this is a play whose cast is predominantly under 18, it’s not headlined as such, representing a subtle but significant shift in the status conferred on work made in collaboration with young artists. The show’s billing as part of the Bristol Green Capital programme is quietly provocative. Yes, it may be implicit that one of the reasons for the ongoing war of which the children are victims is a lack of resources; more to the point, however, would seem to be the idea that when we consider how we want to act in the face of ecological challenges, we should consider what we want our actions to say about our humanity. This compelling and affecting production connects us to what seems impossible about how we all might go on to survive together in this world, and asks us to have hope and to be strong.